History, Description, Discovery of Silver Gilt Penannular Ring-Brooch. Masterpiece of Celtic Jewellery art. is ornamented in La Tene style Celtic decoration. One of the great surviving masterpieces of Celtic metalwork art of the early eighth century, the Tara Brooch is named after the Hill of Tara, seat of the legendary High Kings of Ireland. Dated to about 700 CE, the brooch is seven-inches in length and consists mainly of silver gilt with a knitted silver wire, decorated all over with intricate Celtic interlace patternwork. However, it has no link with either Tara or Irish royalty, having been discovered outside Bettystown, near Laytown, County Meath, in 1850 by a peasant woman. The artifact was only called the Tara Brooch as a sales ploy by the antique dealer who purchased it. Even so, it is considered one of the great treasures of the Irish Insular style in the history of Irish art. Although in appearance the Tara Brooch is a Roman-style penannular ring brooch - most of which were used for fastening woollen cloaks - it was intended primarily as a decorative status symbol. An exquisite example of medieval jewellery art, scholars believe it was made for a wealthy patron, probably male, as a sign of his wealth and high status. This is consistent with the superlative quality of materials and metallurgical craftwork used in the manufacture of the brooch. The construction of the Tara Brooch exemplifies the advanced craft of goldsmithing in Ireland during the era of early Christian art. Fashioned from cast silver, the entire surface is embellished in the La Tène style of Celtic art. Its front is ornamented with panels of interlace design in gold filigree and zoographic triskeles. The settings contain numerous geometric shapes in amber. Several connecting parts of the brooch are emblazoned with designs of animal heads - including wolves and dragons - as well as human heads in glass. Its rear is decorated in plainer style, with panels of silver fastened over copper. The Tara Brooch is one of several great artifacts of Celtic metalwork: such as the Iron Age Broighter Collar, and Petrie Crown, the 8th/9th century Derrynaflan Chalice, the Moylough Belt Shrine, and the Ardagh Chalice, and the processional crosses known as the Tully Lough Cross (8th/9th century) and the 12th century Cross of Cong, created for Turlough O'Connor to hold a relic of the Crucifixion. The Tara Brooch displays no religious iconography - neither Christian nor pagan - which is consistent with other similar brooches of the period. As one of the most interesting examples of Celtic culture, its discovery - along with that of the Ardagh Chalice - lent momentum to the Celtic Cultural Revival of Victorian Britain. 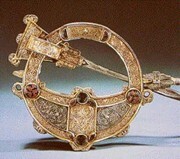 The brooch is on display at the National Museum of Ireland.